• The First International Women Playwrights Conference was held in Buffalo, NY. The Buffalo conference brought together more than 200 women playwrights from over 30 countries around the world. • International Centre for Women Playwrights (ICWP) established in Buffalo, New York, USA, to continue the work of the conference and serve as a communications center for women playwrights internationally. • 2nd International Conference held in Toronto, CANADA. • International Advisory Committee (IAC) formed as an international committee made up of those who attend the conference, to choose the site of the next conference and to provide advice and assistance to its directors. • 3rd International conference held in Adelaide, AUSTRALIA. This was the most successful conference in international attendance. • 4th International Conference in Galway, Ireland. Role of the International Advisory Committee was extended to bring members into more active roles in planning and supporting the conference. An Organizational Committee with a core committee of 22 women volunteers from 10 countries; AUSTRALIA, Egypt, England, France, Greece, India, New Zealand, the Philippines, Sweden, and the USA was formed to reorganise the organization before the 5th International conference in 2000. 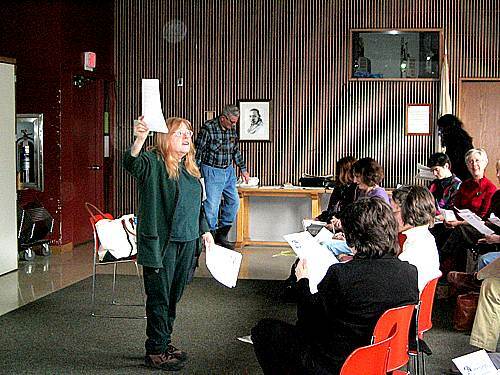 • The International Women Playwrights Centre (ICWP) closed its office in SUNY in Buffalo, USA and became a virtual centre, concentrating its resources on women with Internet access. • The IAC continued planning for the 2000 conference and became a de facto separate organization, Women Playwrights International, which continues to plan and organize the tri-annual conferences. • The ICWP and Women Playwrights International exist as complementary and supportive organizations. • September - Website designed and launched by Sandra Dempsey. • ICWP continued to develop its membership base and plans to register as a charitable 501 (c) 3 organization in USA. • Incorporated as a Non-Profit Corporation in the State of Ohio, USA, February 11. • HER-rah! - Rehearsed readings events to celebrate International Women's Day. • Articles of Incorporation Amended, by vote of the Membership, as per legal advice. • January - Achieved Registration as a not-for-profit organization (501-c-3) with the Internal Revenue Service, USA. • March 3 – 26 - International Play Readings series to celebrate International Women’s Day.